This weekend I got my kicks on Route 66, which is also known as the "Mother Road." Stretching from Chicago to its endpoint in Santa Monica, California, this stretch of almost 3,000 miles of asphalt is probably the most recognizable road in our country. 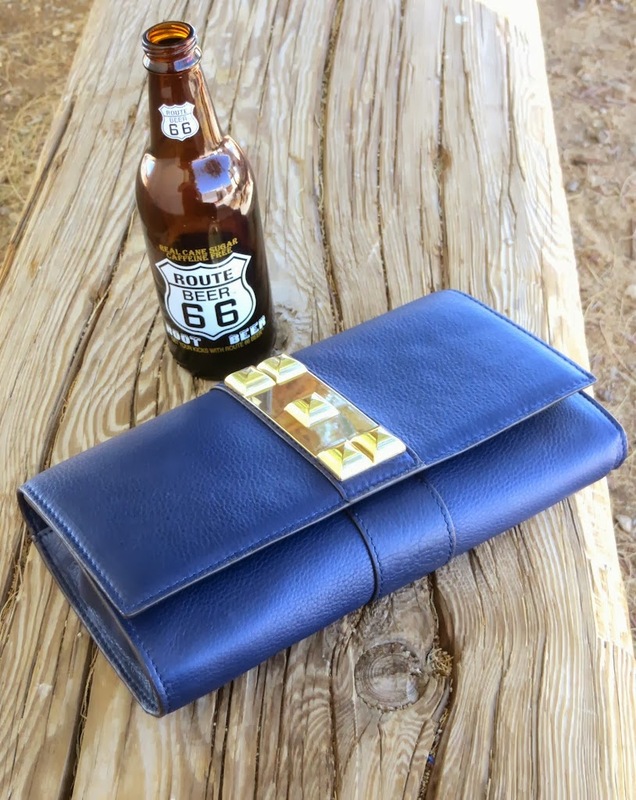 It was originally the route that many took to migrate out west after the Dust Bowl in the 1930s and it's now a cool place to drive a vintage or vintage inspired car or motorcycle and travel back in time. 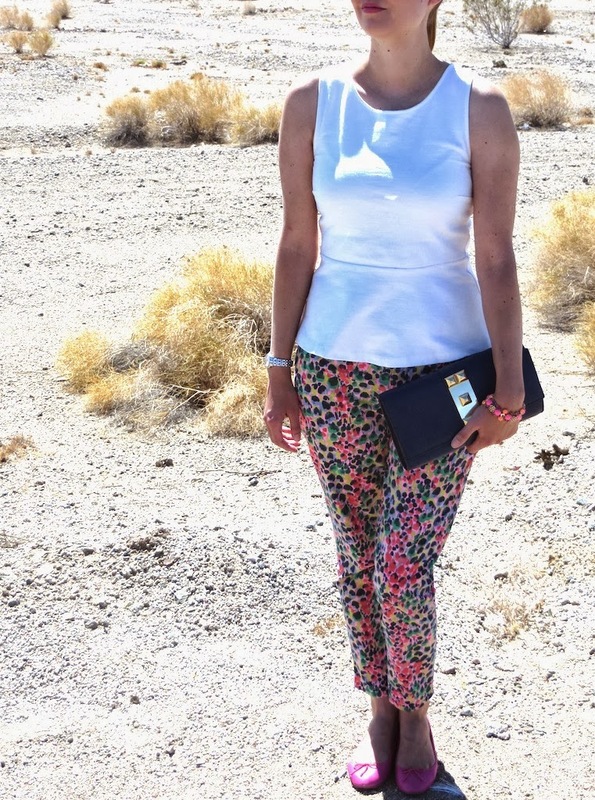 I wasn't really sure how to dress for the occasion as it was cool in the morning and then hot during the day in the desert. It was also somewhat dirty and dusty throughout our journey. I decided upon these Gap "Skinny Minny" khakis in some sort of floral print and a white peplum top to deflect the sun. 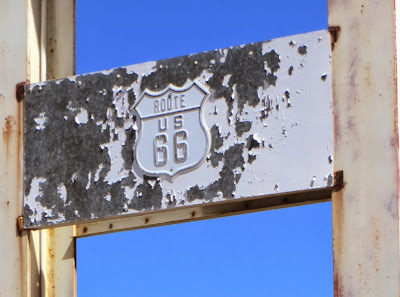 Below you will see me standing on a portion of the road bearing the iconic Route 66 logo. Luckily no cars were coming at the time, as this route is now pretty deserted. My favorite stop on our route was the town of Amboy, population four. It's become a ghost town, but there is still a family that owns the gas station, cafe and runs the post office in town. Despite it's small population you will discover quite a few interesting sites which I have depicted below. Site One: The remnants of an old school. My husband's big orange car, our chariot through Route 66, sits outside the former school's gates. Site Two: Incredible signage for Amboy's lone cafe/motel. 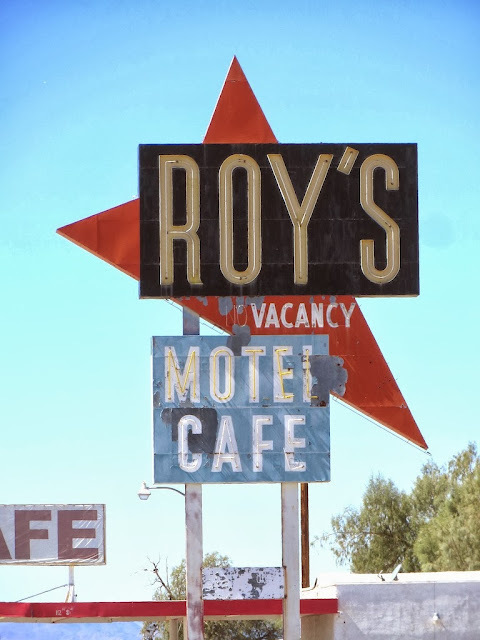 Apparently Roy's was erected in 1959 and once offered travelers a quaint place to eat and rest during their travels on Route 66. Above your will see the very mid-century modern building which was a part of Roy's cafe/motel. 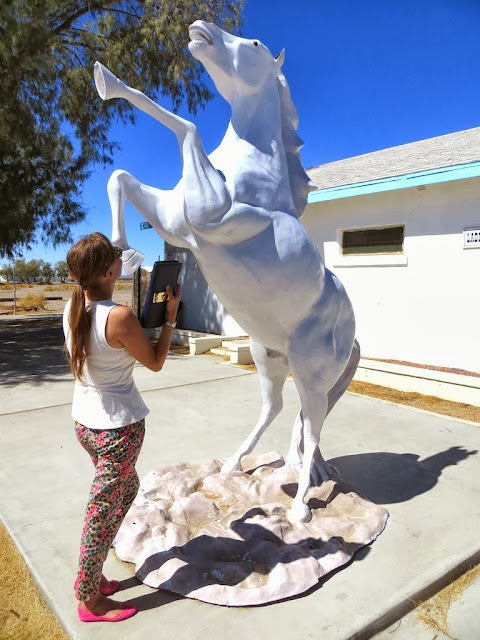 Site Three: A random stallion outside of the bathroom at the gas station in Amboy. Help, I am being attacked! I think the horse had a negative reaction to the loud print on my pants. Sites 4&5: A post office and a church. When the town was populated, these clearly were necessary. As you can see from the picture of the inside of the church, it hasn't been used for awhile although closer inspection shows that it is quite popular with birds and rodents. Site #6: Last but not least, a gigantic crater. Known as the Amboy Crater, this once volcano makes for an unusual site and gives sort of an otherworldly feel to the town. Luckily it is inactive! Above you will see my collection of things featuring the Route 66 logo. Including a car and a bottle of root beer. I'm not usually a fan of rootbeer, but I found the Route 66 brand to be quite refreshing on such a hot day. Below you will see me amidst a sea of Dodge Challengers. 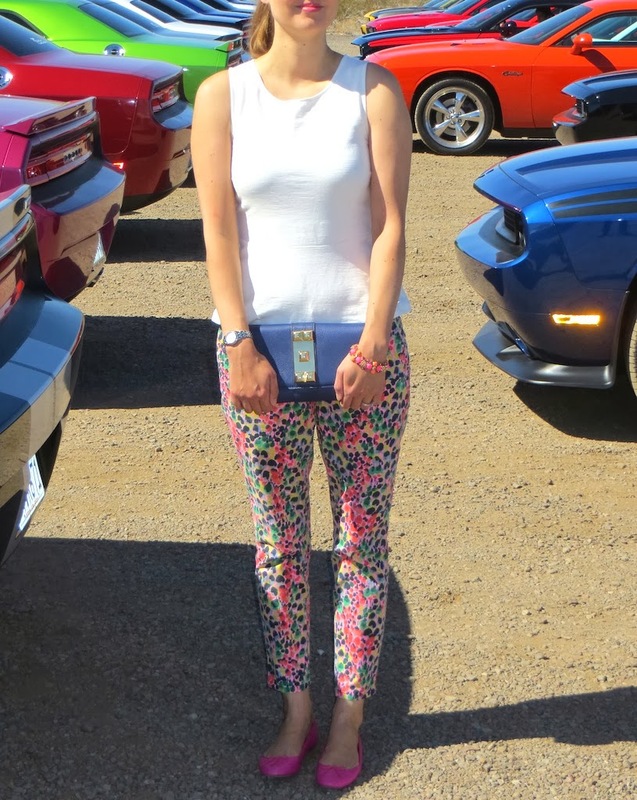 This trip was organized by a car club my husband belongs to and as you can see it was quite a colorful turnout. Almost as colorful as my pants! A crater?! Seriously? That's really, really awesome!